Shinichi Fujimura, the nation's top archaeologist  nicknamed "God's hand" because of his knack of unearthing prehistoric items that disproved established theories  has mud on his face after he admitted to the Mainichi that he buried many of his amazing "discoveries" by himself. Fujimura, 50, a deputy president of private research institute Tohoku Paleolithic Laboratory who is heading the research team, excavating the Kamitakamori dig in Tsukidate, Miyagi Prefecture, was caught on Mainichi cameras as he buried stone tools shortly after 6 a.m. on Oct. 22. Numerous discoveries made this year at the Kamitakamori site were described as proof that primitive man from 600,000 years ago, who was blessed with more intelligence than previously believed, inhabited the area. Confronted with the damning evidence, however, the disgraced archaeologist admitted Saturday that he buried the items because he was "desperate [to find stone tools] ... voices in my head told me that I had to do something." Fujimura, who was also called the "divine digger," confessed that he buried 61 out of 65 items that were unearthed from the dig this year. "I was panicking a bit because I didn't get any hits at Kamitakamori compared to the Ogasaka dig (in Saitama's Chichibu where, this year, he dug up stoneware dating back 500,000 years)," Fujimura said. "I also buried all 29 stoneware 'finds' at the Soshin Fudosaka dig in Shintotsukawa, Hokkaido, earlier this year. But that's all. I swear that my discoveries at Ogasaka and others were genuine." He said that the items he buried were from his own collections, and insisted that no one else was involved in the historic scam. "I personally planted them and no one else took part. Please don't discredit the whole dig, because there were some authentic finds," Fujimura said. "My actions were a disgrace ... I'm really sorry for my family and friends." 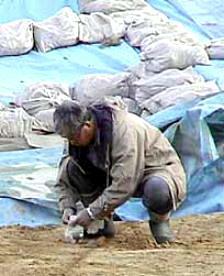 The excavation of the Kamitakamori dig began in November 1993. During a news conference held by the research team on Oct. 27 to announce its latest "discovery," Fujimura interrupted the procedure and brought the media corps to the dig to "unearth" more items that he had planted in sensational fashion. Toshiaki Kamada, the president of Tohoku Paleolithic Laboratory in Tagajo, Miyagi Prefecture, was devastated. "I don't know what made him to do this. It's really unfortunate that everything he has done in the past 30 years will now go down the drain because he buried stoneware at Kamitakamori," Kamada said. Research team member Hiroshi Kajiwara, a professor at Tohoku Fukushi University in Sendai, described Fujimura's actions as a "nightmare" as he watched the Mainichi footage on Saturday. "This is nightmarish stuff," Kajiwara said with a deep sigh. "No one can defend this. Why on earth did he do such a stupid thing?" On Sunday, Fujimura broke down in tears as he faced the media at a hastily arranged news conference at the Miyagi Prefectural Government headquarters in Sendai alongside Kamada and Kajiwara. "I don't know what to say to my instructors, pals, students and everyone who had supported me," Fujimura said. Kamada revealed that Fujimura sometimes had bouts of manic depression recently and defended him by saying that his fellow researchers placed "too much pressure on him." Kajiwara, who was struggling to contain his anger, said "My 20 years of research is ruined." But both Kamada and Kajiwara admitted that they did not carry out thorough checks on Fujimura's discoveries because of his reputation. Fujimura started to unearth ancient remains in 1972 as a keen amateur archeologist, while a full-time employee of a manufacturing company, which he joined after high-school graduation, until last November. He shot to the fame in 1981 after discovering the oldest stoneware in the country ever at the time, from a stratum dating back over 40,000 years. Fujimura earned nicknames like "divine digger" and the possessor of "God's hand" as he kept on unearthing stoneware from older dates  he often rewrote history by 100,000 years with his new discoveries  from over 180 digs nationwide. "Every historically significant finding was made while others were not digging," a researcher who worked with Fujimura for over a decade in various excavating projects said.